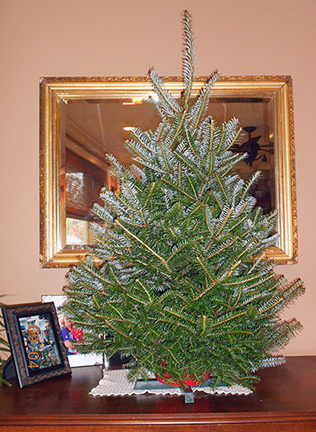 Although some tree species - such as the North Carolina Fraser fir, Douglas-fir, Balsam fir & Scotch pine - last longer naturally, consumers can find the best specimen through examination, i.e. by looking at, touching, feeling, smelling and shaking the tree. It is generally best to remove a 1/4 to 1/2 inch disc from the trunk before you place the tree in a water holding stand. Always make a new cut before putting the tree in a stand. Generally, trees will require a quart of water daily per inch of stem diameter in the stand, although warmer temperatures and lower relative humidity will require more water. A trunk split should have no effect on a tree's ability to take water or how long the tree lasts, if a fresh cut has been made on the trunk. Trees shipped from major Christmas tree production areas usually arrive with a moisture level equal to locally grown trees. The greatest effect on a tree's quality and moisture level is caused by handling of the trees on retail lots. When storing trees, they should be kept in a shaded area & protected from extreme temperatures and wind. Often, covering trees with shade cloth, burlap or boughs and spraying the piles with water is most effective in protecting trees. Retailers can reduce the rate of drying on trees displayed by spraying their foliage during the night and early morning, as the greatest risk for drying happens when trees are unbaled and displayed. An indicator of a tree's freshness & moisture is its needles. Needles on fresh fir trees break crisply when bent sharply with the fingers. Trees that have lost a significant amount of moisture are more pliable and tend to bend without breaking. The needles on fresh pines do not break, because of their fibrous nature, unless they are very dry.